As you may have heard, over the last few months we have purchased an American white oak 5 liter barrel and have been aging our own cocktails. Of course, the first few batches are part of experimenting in order to get the best flavors. Time, along with the ingredients are important to perfecting the flavors we are looking for and patience is also a big part of the process. Whiskey is not only what we age, that was just a basic start of our test runs to get more familiar with the barrel. Our barrel aged Makers Mark went over extremely well, and we are currently releasing our next cocktail. Today, we are unveiling our own version of one of the classics with an Uptown twist of course. 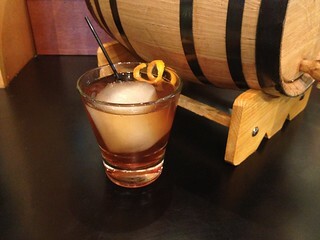 Uptown Grill's Barrel Aged Negroni. Finally, after 4 weeks of age, the characteristics we desire are being bottled and sold to our customers. This is a bit of a non-traditional batch because not only are we getting the vanilla and clove flavors from the oak barrel.... but you will also experience the hints of the previous spirit, whiskey. It makes for quite an interesting flavor profile. The Negroni is a classic aperitif cocktail that is made of three equal parts.... gin, sweet vermouth and Campari. Although most classic cocktail have a foggy origin, this drink was created in Florence, Italy back in 1919 by Count Camillo Negroni as an alteration of the Americano where the soda water was replaced by the gin and the orange garnish replaced the lemon. Three simple ingredients make it one of the easiest drinks to make. In recent years, the Negroni has risen in popularity in the mixological community and has now joined the Dry Martini and Manhattan to form the Triple Crown of classic cocktails. In this day and age, with all of the creative minds bringing together amazing ideas on all sorts of new cocktails, the Negroni is perfect for any time. Although often forgotten, here is your chance to enjoy our version. Day or night, the weather is just right for a Negroni.